Back in 2002, Brazilian mechanic Alfredo Moser had what might be called a “lightbulb moment” during one of many regular blackouts in his town. It was when he noticed that local factories would remain lit during blackouts that he decided to do a little experimentation; using only water, bleach, and an empty bottle, he successfully created 40 to 60 watts of light through a simple refraction process. So how exactly does this work? All Moser does to create the bulb is fill a bottle with water, add two capfuls of bleach to keep it, cut a hole in a roof tile, then push the bottle into the hole from the bottom up. He then seals it in with polyester resin and allows sunlight to do the rest. 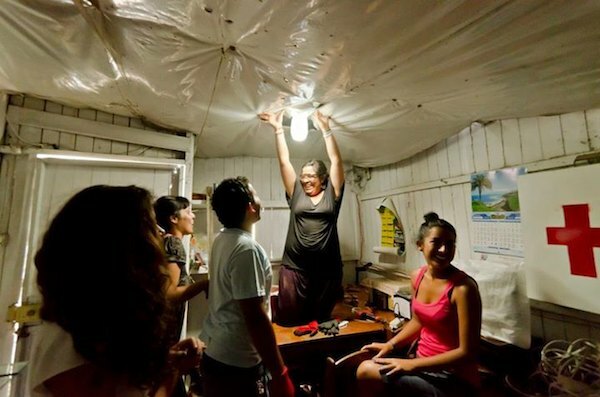 It’s the perfect solution for dwellings in poor neighborhoods that don’t have windows or other access to enough light. While the unique concept is only useful during the day, it is still becoming an invaluable resource to regions where electricity is a luxury and power outages are the norm. That’s the main potential Angelo Diaz, director of the MyShelter Foundation in the Philippines, took from it when he contacted Moser to help distribute the product to people without reliable electricity. Together, the pair launched the ‘Liter of Light’ campaign, which has so far lit up 28,000 homes in Manila and even expanded to Switzerland, Indonesia, and India. Not only are the light inexpensive to make, free to use, and accessible to just about anyone, but it is also much safer and more eco-friendly than frequently used kerosene lamps. The pollution caused by kerosene often leads to fatal respiratory issues and can lead to accidental fires, where the bottle light bulb poses no dangerous risks. The goal of Moser and the MyShelter Foundation is to light up 1 million homes with a Liter of Light by 2015.